I will be the first to admit that I love food. But usually I take the time to find healthy foods to eat, because then I can generally eat as much as I need without feeling guilty. Healthy food in my case includes a variety of fruits, nuts and vegetables, because I discovered that they have a ton of nutrients such as vitamins, minerals, water, protein and carbohydrates, which my body needs daily. And I don’t usually gain weight when I eat foods like this. I also prefer to get my nutrients from natural foods, because they are generally utilized more efficiently by my body. Clean eating is one way I am proactive about my health. It helps ensure that I remain sick-free and happy. And a recent study by Harvard discussed the consequences of healthy eating. “It is the first study to show that improving diet quality over at least a dozen years is associated with lower total and cardiovascular mortality, and underscores the importance of maintaining healthy eating patterns over the long term,” Harvard reports. This study examined 74,000 adults and changes in their diet quality over a 12-year period (1986-1998). The study also assessed the participants’ risk of dying during the subsequent 12 years (1998-2010). Study participants answered questions about their diets every four years and about their lifestyle and health every two years. Diets were scored using three methods: the 2010 Alternate Healthy Eating Index, the Alternate Mediterranean Diet score and the Dietary Approaches to Stop Hypertension (DASH) diet score. Each of these methods assign scores to various types of foods and nutrients. Less healthy foods had lower score numbers. More importantly, major improvement was seen in participants who made small changes to their diets. For example, swapping just one serving of red or processed meat for one serving of nuts or legumes was linked with an 8%-17% reduction in the risk of death. Poor diets were associated with a 6%-12% increase in death. The study confirms that eating healthy is not about being on a “diet.” It’s about leading a healthy lifestyle, and a major part of this involves eating healthy food. There are some things we cannot control, like our genes, but this study proves how maintaining a healthy diet over time may prevent an array of diseases or even an untimely death. I know it can be overwhelming to figure out what to eat and how much. But take comfort in knowing even small changes can make a big difference. Try to do something different and healthier every day, and in just a few months you may realize you are leading a better lifestyle. Here are some tips on how you can be proactive about maintaining a healthy diet. Educate yourself about the nutrients present in your food. 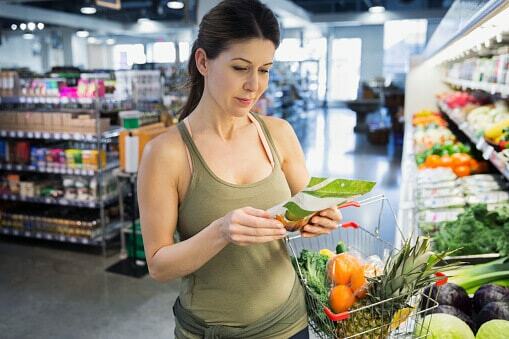 Do you know the vitamin and mineral content of the foods you buy? Do you know how much of each nutrient you need? Before you go grocery shopping, check out the USDA National Nutrient Database. It’s very easy to use and will tell you what is in one cup of a particular food item. We also provide a significant amount of information about the nutrients found in many foods. Don’t punish yourself. Eating healthy should never feel like a punishment. It’s okay if you do not like salad. Blend greens, like spinach and kale, in your morning smoothie. You will still get the benefits of eating a salad without actually eating a salad. Challenge yourself. If you are a heavy red meat eater, try giving up red meat for a week. You may discover you don’t even miss it, and you prefer other proteins like fish. As we see from the study, small changes can make a big difference. Make it fun. Host healthy dinner parties or involve your kids when you cook. If you make people you love a part of your healthy lifestyle, it may keep you motivated to maintain healthy eating habits over a longer period of time, hopefully for life! Know what you need. You may already be a super healthy eater, but this does not mean you do not have any vitamin or mineral deficiencies. Get nutritional testing so you can fine-tune your diet and make it specifically tailored to your body’s needs. You may even discover you are getting too much of a good thing! Explore. I’m an an avid gardener, and this summer I took the initiative to plant new foods. By doing this, I incorporated new healthy foods into my diet, like loquats. I discovered dandelion greens are super healthy and something I can easily throw into a smoothie or salad. By exploring, I never get bored. Find alternatives. The occasional treat of your favorite junk food is not something you should deny yourself. You have to live a little! But with a little effort, you may be able to find healthier alternatives to some of your favorite junk foods. For example, maybe you crave the occasional bag of candy. The next time you have this craving, have a handful of figs. They may satisfy your sweet tooth, and they are packed with many essential vitamins and minerals. The fiber in figs will also help keep you full. Track it. We are always on our phones -- texting, emailing, scheduling appointments and taking photos. So why not do something for your health while using your mobile device? Use apps, like Calorific, to track calories and the foods you eat. You may find that keeping a record helps hold yourself accountable. You may also discover you are consuming a lot of unnecessary calories, for example maybe at Happy Hour or with your morning coffee. I hope you find this study as inspiring as I do. We have more control over our lives than we realize. Please share some of your tips on how you maintain a healthy diet.